Primula moschophora I. B. Balfour & Forrest in I. B. Balfour, Notes Roy. Bot. Gard. Edinburgh. 9: 186. 1916. Type specimen: Forrest 12076 resides at Royal Botanic Garden Edinburgh (specimen E00024195) and Paris (specimen P04544173) and British Museum (specimens BM000996899, BM000996900). P. bella ssp moschophora (syn): (I. B. Balfour & Forrest) W. W. Smith & Forrest, Notes Roy. Bot. Gard. Edinburgh. 16: 15. 1928. Type specimen: as above. 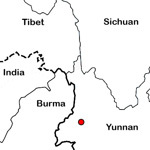 Distribution: W Yunnan, China and N Burma (Myanmar). A tiny species (1-2 cm), similar to P. bella and P. tenella, but distinguished by the usual presence of stolons. Flowers are single but sometimes 2 or 3 on a scape, lilac, and with hairs in the throat. If you have an image of this species, please contact the webmaster.